^ a b Global Mammal Assessment Team (2008年). "Homo sapiens". IUCN Red List of Threatened Species. Version 2008. International Union for Conservation of Nature. Retrieved 2015年10月22日. ^ Linné, Carl von (1758). Systema naturæ. Regnum animale. (10 ed.). pp. 18, 20. http://www.biodiversitylibrary.org/item/80764#page/28/mode/1up 2015年10月22日閲覧。. ^ Hublin, J. J. (2009). 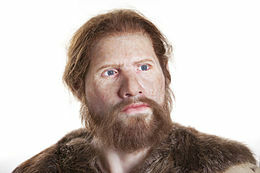 “The origin of Neandertals”. Proceedings of the National Academy of Sciences 106 (38): 16022–7. Bibcode: 2009PNAS..10616022H. doi:10.1073/pnas.0904119106. JSTOR 40485013. PMC: 2752594. PMID 19805257. https://www.ncbi.nlm.nih.gov/pmc/articles/PMC2752594/. ^ Harvati, K.; Frost, S.R. ; McNulty, K.P. (2004). Neanderthal taxonomy reconsidered: implications of 3D primate models of intra- and interspecific differences. PMID 14745010. http://www.ncbi.nlm.nih.gov/pubmed/14745010/ 2015年10月22日閲覧。. ^ Wolpoff, MH; Hawks, J; Caspari, R (2000). “Multiregional, not multiple origins”. Am J Phys Anthropol 112 (1): 129–36. doi:[[doi:10.1002%2F%28SICI%291096-8644%28200005%29112%3A1%3C129%3A%3AAID-AJPA11%3E3.0.CO%3B2-K|10.1002/(SICI)1096-8644(200005)112:1<129::AID-AJPA11>3.0.CO;2-K]]. PMID 10766948. http://www3.interscience.wiley.com/journal/71008905/abstract. ^ Wolpoff, MH; JN Spuhler; FH Smith; J Radovcic; G Pope; DW Frayer; R Eckhardt; G Clark (1988). “Modern human origins”. Science 241 (4867): 772–4. doi:10.1126/science.3136545. PMID 3136545. http://www.sciencemag.org/cgi/pdf_extract/241/4867/772. ^ Hua Liu, et al. A Geographically Explicit Genetic Model of Worldwide Human-Settlement History. The American Journal of Human Genetics, volume 79 (2006), pages 230–237, quote: Currently available genetic and archaeological evidence is generally interpreted as supportive of a recent single origin of modern humans in East Africa. However, this is where the near consensus on human settlement history ends, and considerable uncertainty clouds any more detailed aspect of human colonization history. ^ Green et al., RE; Krause, J; Briggs, AW; Maricic, T; Stenzel, U; Kircher, M; Patterson, N; Li, H et al. (2010). “A Draft Sequence of the Neandertal Genome”. Science (Science) 328 (5979): 710–22. doi:10.1126/science.1188021. PMID 20448178. http://www.sciencemag.org/cgi/content/full/328/5979/710. ^ Green, R. E., Krause, J, Ptak, S. E., Briggs, A. W., Ronan, M. T., Simons, J. F. (2006). Analysis of one million base pairs of Neanderthal DNA. Nature. pp. 16, 330–336. http://www.nature.com/nature/journal/v444/n7117/abs/nature05336.html. ^ Alemseged, Z., Coppens, Y., Geraads, D. (2002). “Hominid cranium from Homo: Description and taxonomy of Homo-323-1976-896”. Am J Phys Anthropol 117 (2): 103–12. doi:10.1002/ajpa.10032. PMID 11815945. ^ Stoneking, Mark; Soodyall, Himla (1996). “Human evolution and the mitochondrial genome”. Current Opinion in Genetics & Development 6 (6): 731–6. doi:10.1016/S0959-437X(96)80028-1. ^ Henn, Brenna; Gignoux, Christopher R.; Jobin, Matthew (2011). “Hunter-gatherer genomic diversity suggests a southern African origin for modern humans”. Proceedings of the National Academy of Sciences of the United States of America (National Academy of Sciences) 108 (13): 5154–62. doi:10.1073/pnas.1017511108. ^ Gill, Victoria (2009年5月1日). “Africa's genetic secrets unlocked”. BBC News. http://news.bbc.co.uk/2/hi/science/nature/8027269.stm ; the results were published in the online edition of the journal Science.